The Mini-Clamp is perfect for PAR 38's, pinspots, and other small fixtures. The clamp is made from an aircraft-grade aluminum extrusion with micro-grooves that conform to the pipe for real gripping power. The Mini-Clamp will grip from 3/4" to 2" tubing. 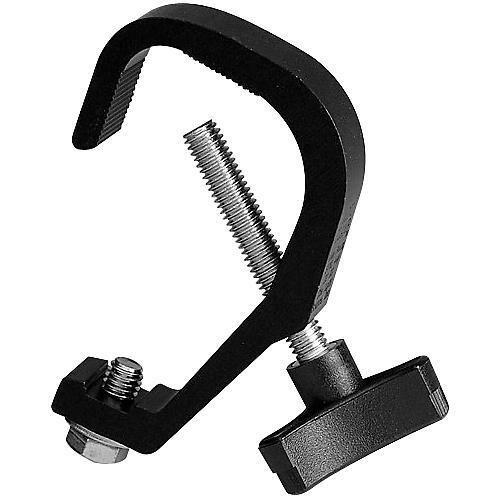 The pipe bolt is 3/8"-16 TPI with a 2" black plastic knob. It's yoke bolt is a 3/8"-16 TPI at 3/4" long. Despite the fact that the Mini-Clamp weighs less than 6oz., the safe vertical weight load is 150 pounds. Safe vertical working load: 150lb.